Donald Jones received a donor kidney from his father. Donald Jones III was one of those long-odds guys. Before he started catching passes for the Buffalo Bills, he was an undrafted free agent. Before that, he was at Youngstown State. Before that, junior college. According to a feature by the Associated Press, when Jones was a sophomore, he found out he had a kidney disease called IgA nephropathy, which is the same thing that caused former NBA star Alonzo Mourning to get a kidney transplant in 2003. Jones didn’t do that right away, though. He kept playing football, pursuing and eventually achieving that unlikely dream. 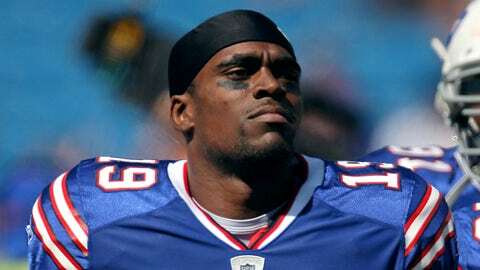 He caught 82 passes for the Buffalo Bills from 2010-12. He never talked about it publicly, but during the 2012 season Jones noticed his hands and feet had started swelling, and he was peeing blood. The Bills took him off the active roster and when he saw a doctor, the news was bad. Jones’ kidneys were shot. His options were transplant or dialysis. He didn’t have to look far for a match. His father, Donald Jones II, gave up one of his kidneys for his son. "He and my mom gave me life, and then for him to give me a second chance at life, it’s like the most amazing feeling in the world," Donald Jones III told the Associated Press from a New York hospital. "For him to have to go through all of this stuff, it’s like, ‘Man, you know I love you.’"
Football, now, is out of the question for Jones. But, like Mourning, who continued his NBA career post-transplant, winning an NBA championship in 2006, Jones intends to keep playing sports. His first love was baseball, anyway, and some MLB organizations have shown interest in him. He plans to play winter ball next year. "I’m going to make a run at it," Jones said. "I’m still young." That would be another long shot, of course, but Jones is used to that. "I don’t put anything past this guy," Donald Jones II said. "He has definitely made me a believer."